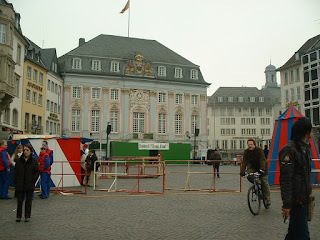 I'd heard that on the Sunday of Karneval, there was some sort of symbolic storming on the old Town Hall. When I got the appropriate plaza, however, not much was going on and there was no sign of when the action would really begin, so I took a couple pictures and went back home. Here's a bunch of marchers, getting ready for their act -- which was rather cute. Here's the building I thought was to be stormed -- they've cleared the area and set up a platform, but nothing is happening. 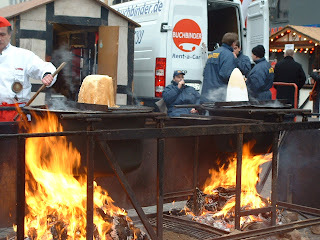 Remember my praise of Feuerzangenbowle? Well, here's a picture of two large vats of it being made over a fire (yeah, those lumps on top are giant chunks of sugar). 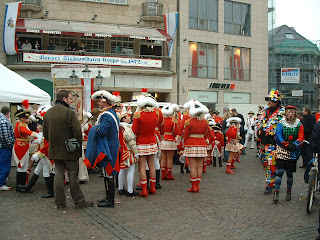 I found this website which describes the Karneval activities in Bonn and has pictures of previous years festivities. So, Cologne is the place to be for Karneval in Germany, or at least so it seems. Do I have the energy to take the 30 minute train ride there tomorrow for the big parade, just so I can get trampled by drunk Germans? I'm not feeling it right now, but we'll see. Jessica - Thanks, but now I have to add four more places to my 'to visit' list.